Ghost Rockets (also called “Scandinavian ghost rockets”) is the name given to mysterious rocket or missile shaped objects which were sighted on many different occasions between May and December 1946, with peaks on the 9th and 11th August of 1946. They were seen primarily in Sweden and nearby Scandinavian countries, but also in other European countries as well. Altogether some 2000 reported sightings were logged, 200 of them being on radar, and a number of fragments were reported found by military authorities. Many Ufologists consider the Ghost Rockets to be the first widespread sightings after World War II of what later came to be known as Unidentified flying objects or UFOs. Their origin is to this day unknown, but at the time it was thought likely that they originated from the former German rocket facility at Peenemünde and were long-range tests by the Russians of captured German V-1 or V-2 missiles, or perhaps another early form of cruise missile because of the ways they were sometimes seen to maneuver. This prompted the Swedish army to issue a directive stating that newspapers were not to report the exact location of a sighting, or any information regarding the direction or speed of the object. This information, they reasoned, was vital for evaluation purposes to the nation or nations performing the tests. Russian origins was quickly ruled out by Swedish, British, and U.S. military investigators because no recognizable rocket fragments were ever found, the objects usually left no exhaust trail, some moved too slowly and usually flew horizontally, they sometimes traveled and maneuvered in formation, and they were usually silent. The sightings most often consisted of fast flying rocket or missile shaped objects, with or without wings, visible for mere seconds. Instances of slower moving cigar shaped objects are also known. A hissing or rumbling sound was sometimes reported. Crashes were not uncommon, almost always in lakes. Reports were made of objects crashing into a lake, then propelling themselves across the surface before sinking, as well as ordinary crashes. 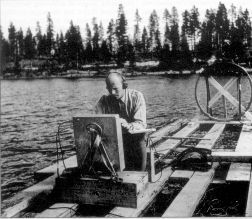 The Swedish military performed several dives in the affected lakes shortly after the crashes, but found nothing, other than occasional craters in the lake bottom, or torn off aquatic plants. The best known of these crashes occurred on July 19, 1946, into Lake Kölmjärv, Sweden. Witnesses reported a gray, rocket-shaped object with wings crashing in the lake. One witness interviewed heard a thunderclap, possibly the object exploding. However, a 3 week military search conducted in intense secrecy again turned up nothing. The Swedish Air Force officer who led the search, Karl-Gösta Bartoll, was interviewed in 1984. 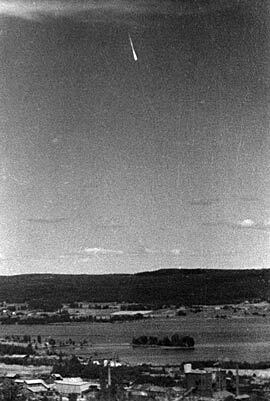 On December 3, 1946, a memo was drafted for the Swedish Ghost Rocket committee stating “nearly one hundred impacts have been reported and thirty pieces of debris have been received and examined by FOA.” (later said to be meteorite fragments) Of the nearly 1000 reports that had been received by the Swedish Defense Staff to November 29, 225 were considered observations of “real physical objects” and every one had been seen in broad daylight. On August 20, 1946, the New York Times reported that two U.S. experts on aerial warfare, aviation legend General Jimmy Doolittle and General David Sarnoff, president of RCA, arrived in Stockholm, ostensibly on private business and independently of each other. The official explanation was that Doolittle, who was now vice-president of the Shell Oil Company, was inspecting Shell branch offices in Europe, while Sarnoff, a former member of General Dwight D. Eisenhower’s London staff, was studying the market for radio equipment. However, unofficially and secretly, the two had been sent by Lt. General Hoyt Vandenberg, then director of the Central Intelligence Group (CIG), to investigate the ghost rocket situation. The “ghost rocket” reports were not confined to Scandanavian countries. Similar objects were soon reported early the following month by British Army units in Greece, especially around Thessaloniki. In an interview on September 5, 1946, the Greek Prime Minister, Konstantinos Tsaldaris, likewise reported a number of projectiles had been seen over Macedonia and Salonika on September 1. In mid-September, they were also seen in Portugal, and then in Belgium and Italy. The Greek government conducted their own investigation, with their leading scientist, physicist Dr. Paul Santorini, in charge. Santorini had been a developer of the proximity fuze on the first A-bomb and held patents on guidance systems for Nike missiles and radar systems. Santorini was supplied by the Greek Army with a team of engineers to investigate what again were believed to be Russian missiles flying over Greece.